A short hike that takes you from Kita Kamakura Station 北鎌倉駅 to the Great Buddha 大仏. There’s lots of interesting shrines to see on the way, and a large park where you can have a picnic lunch. A nice alternative to the crowded tourist areas in Kamakura 鎌倉. Suitable for families, but not many shops if you need to buy food. 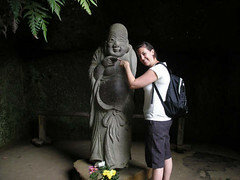 If you are interested in this hike, you might also be interested in the Kamakura Ten-en Hiking Course. There are a number of nice walks in the hills surrounding Kamakura 鎌倉. The Mapple website has a map of the area that includes trails – http://map.mapple.net/_mdspot_sc40000_sidG01401136102_lon139.5506925_lat35.3307686111111/index.htm, but is only in Japanese. The trail head for the Daibutsu course is marked by the flag, and trails are marked with a blue dashed line. From Kita Kamakura Station 北鎌倉駅, take the south west exit and head out to the main road. Before leaving the station area, it’s possible to access Engakuji Temple 円覚寺, the second in Kamakura’s top five Zen temples, from the east side. Continuing on the west side of the tracks, take a left and follow the road for about 5 minutes. 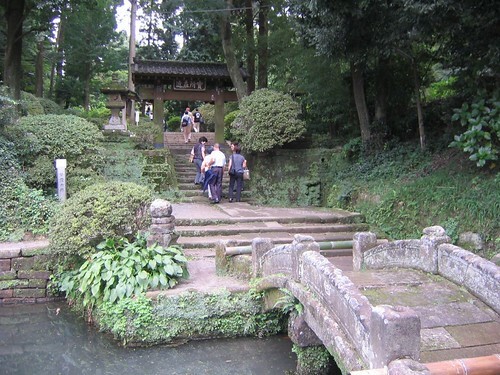 On the right you will pass Shokozan-Tokeiji Temple 松岡山 東慶寺. This used to be a nunnery that was also a sanctuary for women seeking a divorce. Grounds include a garden and Treasure house, and entrance is 100yen (not including the Treasure house, which is a further 300yen). Another 5 minutes along the road, and you will see Jochiji Temple 浄智寺 on the right. This is the start of the trail. Jochiji Temple 浄智寺 is another of the five main Zen temples of Kamakura. Grounds include a garden, well, bell tower, and statue of the god of luck. Entrance is 200yen. To continue hiking, follow the road alongside the temple on the left. At the end of the road the trail heads up into the hills. Follow this path to Kuzuharagaoka Shrine 葛原ヶ岡 and Genjiyama park 源氏山公園. Kuzuharagaoka 葛原ヶ岡 is a shrine built on an execution ground from the Kamakura Period. From here the park is along the path to the right. This is a good place to stop and rest. In approximately the middle of the park is a road to the right leading down to Zeniarai Benten Shrine 銭荒弁天. Here you can wash your money to make it double, or buy a talisman that a priest will bless by striking a flint over it. The shrine is on the right of the road through a stone tunnel. Once you are finished here, continue down the road to the residential area. Follow the road until you reach a Y intersection leading to the right with signs pointing to Sasuke Inari Shrine 佐助稲荷. Walk along this road to the end and up the stairs to the shrine. Keep climbing the stairs that lead up behind the shrine until you reach the top (don’t worry, it’s not far!) At the top you can rejoin the Daibutsu Hiking Course 大仏ハイキングコース by turning left. The rest of this trail only takes about 20 minutes to finish, and you will come down hill and exit on Route 32 next to a tunnel. Just turn left and follow the road to the next corner, then turn left again. On the left is Kotoku-In 高徳院 and the Great Buddha 大仏. Entrance is 200yen, and an extra 20yen if you want to enter the Buddha. 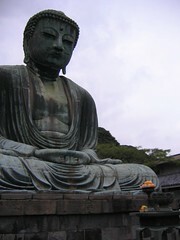 The Kamakura Daibutsu 大仏 is the largest outdoor Buddha in Japan and certainly worth a look. From Tokyo 東京, catch the JR Yokosuka line 横須賀線 to Kita Kamakura 北鎌倉駅. It takes 50 minutes and costs 780yen. Or from Shinjuku 新宿 you can catch the JR Shonan Shinjuku line 湘南新宿線 to Kita Kamakura 北鎌倉駅. It takes 52 minutes and costs 890yen. Trains run regularly on these lines. Sometimes a train won’t take you the whole distance and you might need to change to go further on. From Kotoku-In 高徳院 buses leave regularly from the entrance to Kamakura Station 鎌倉駅 for 190yen approximately. Or you can walk the 1.4km back to the station. Thank you for this very detailed post! I’ve done this hike a few times, but next month I’ll be taking a class on the hike so I really need a detailed guide, and this is perfect. Thank you so much for taking the time to do this, I’m sure many, many people will find it useful. I’m really looking forward to more hiking posts. And hey, if you ever need a hiking buddy drop me a line! Thank you for the lovely comment! If just one person finds the write ups that I do useful then I’m over the moon! I’ve got another few hiking posts I’m working on now, so keep an eye out! I’m doing it today with your instructions in hand. I’m glad you had a great time! thanks for the link! Thanks for the comment! I’m glad my site has been of help! I checked out your youtube channel and you have some nice videos! If you do hike and really want some company (I hesitate to say I would be good at ‘guiding’) let me know! I’m always happy to get out and meet new people! I just did the Ten-en, then Daibutsu hikes last weekend. With a break for lunch just outside of the Kenchoji Temple. Thanks for the detailed info, it came in handy. And what a great couple of hikes! Really no crowd at all (as opposed to Kenchoji and at the Daibutsu Buddha itself) and spectacular views of the hills, the city and the sea. THANK YOU for the hike altitude profile with your map at GPSies.